I have two batches of negs. One was marked Freshman party; the other said Sophomore party. I’m going to break them up into two postings to make things a little less confusing. 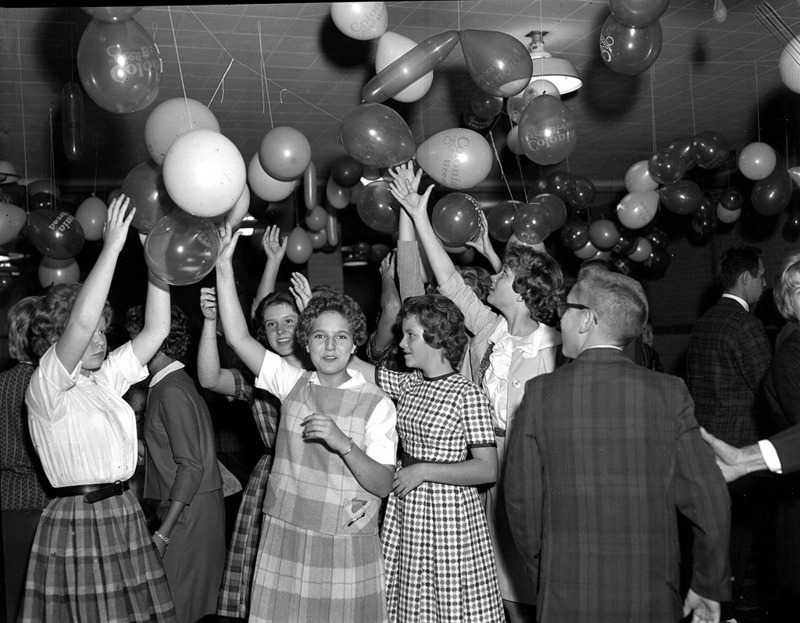 Is this the 1966 Freshman Class? I think I recognize some of these kids as being futures members of the Class of 1966. Anybody want to take a stab at filling in the blanks? Was this the Tiger Den? The sign by the door says “Book Exchange,” but this has the feel of the Tiger Den. I tried to get a photo of the Tiger Den when I was back in October, but that part of the building has been reconfigured into classrooms. The door was locked, so I gave up. I ran a picture of this drink machine on my bike blog when I was advocating a glass bottle tax or deposit to encourage folks to recycle their beer bottles instead of throwing where I run over them. 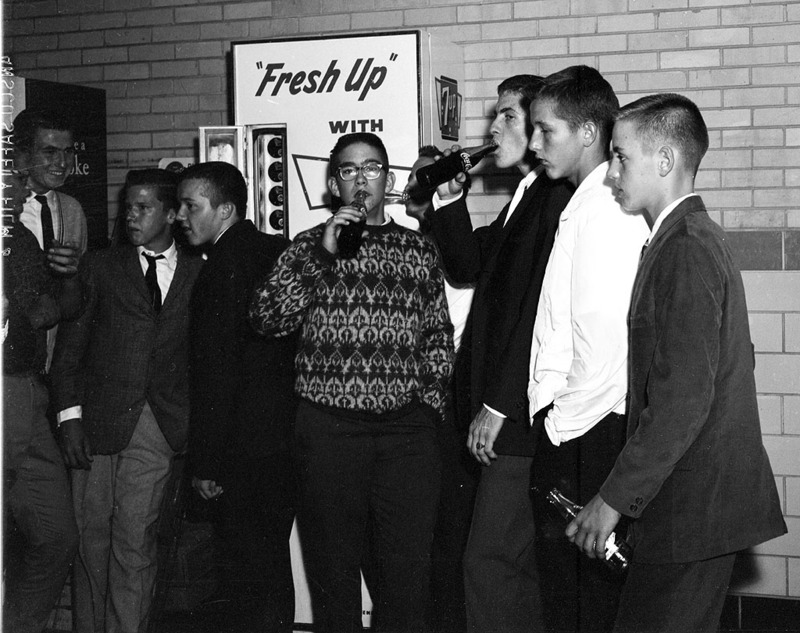 I’m not positive, but I think I see some guys from my Class of 65 prowling around looking for freshmen girls. I’ll run photos from the Sophomore party tomorrow. 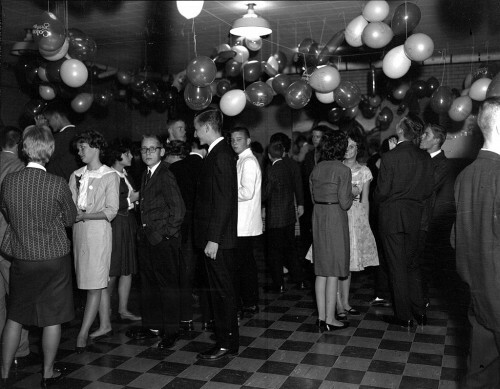 I recognize a lot of those folks as being in the Class of 1965. 1st photo: Mike Young and I think one of the Barringer twins. 2nd photo: short kid is Gary Fisher. taller girl is Linda Maddox, maybe. Harold Pruitt and Bob Young. 5th photo: Jesse James, Jim Williams and Bert Lehman. Ms. Vivian Keyes..I wasn’t a favorite of hers..she didn’t understand my sense of humor!! I’m not sure but I think she was “old school”. I missed Dee Ann Bochorst and Terry Robinson in the 3rd photo. My sequence is off. I thought that we (’65)were last freshman class entering CHS. The 8th and 9th grade were at the junior high and the 7th grade was at Schultz. Miss Sadler, would you like to weigh in here? Why do we look so old? Maybe because we were dressed like adults and expected to act like adults. We were only 14-15. Okay, off the ole-codger soapbox. These are from a freshman party. 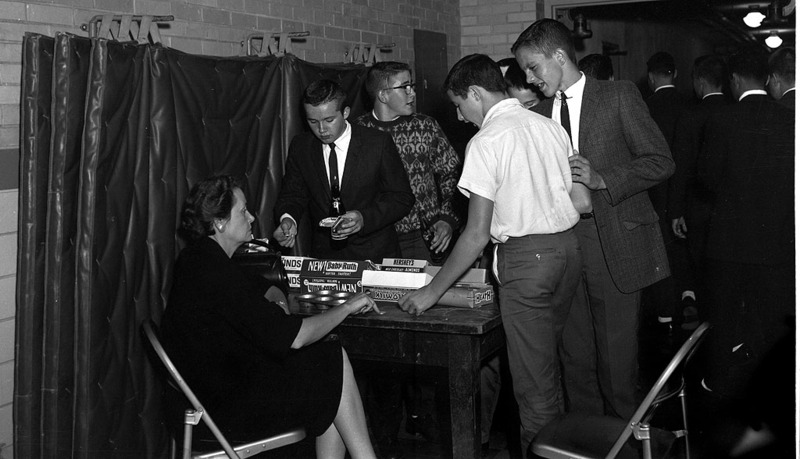 In photo 1, I recognize Donna Brothers, Mike Friese, and possibly Mike Young. Photo 2, Jim Cochran, Gary Fischer, and the late Gregg Nunnelee. Joe, I am proud to have been in the next-to-last freshman class and the and am greatful to the Class of 65 to go through the discomfort of being the first freshman class after hazing was abolished. Your MSHP experience is showing with all this identification. Well, I was wrong. It is amazing how much that you don’t remember after 45 plus years. I should have consulted the GIRARDOT. I graduated before any of these pictures were taken but I can answer the question posed as a caption of picture three. 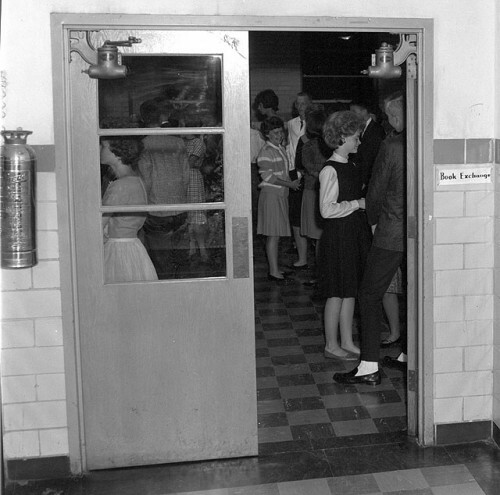 The picture is taken at the hallway (north) entrance to the Tiger Den. Some time during the years I was at Central from the fall of 1958 to the spring of 1962, the book exchange was built in the room on the west side of the Tiger Den. As you look at the picture, the book exchange would be to the right after you went thru the north doors. George Smith and I were monitors during 4th hour (lunch hour) in the Tiger Den. I still have several 45s marked Tiger Den because I would bring them to play during 4th hour. I can still picture George, who manned the record player, spinning the 45s. 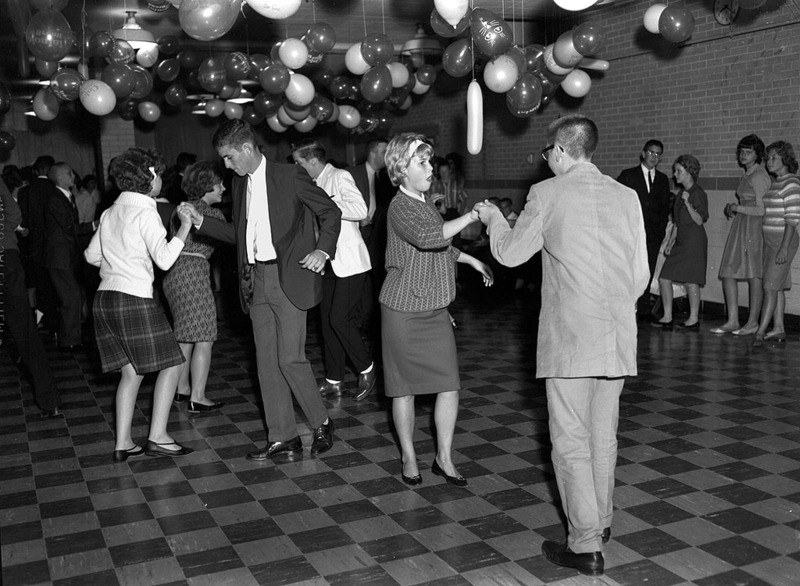 Ken’s previous ‘white socks’ comment and the fact they are actually holding hands while dancing should mark the year as 1962, when I graduated. Both quaint customs died shortly thereafter. Actually, Ken, I think we were the first Senior class to not have Freshmen….does that compute? There are no Freshmen in our last Girardot. My class was the last freshman class. We began in fall 1963 and graduated spring 1967. Thanks Joe, I still look at license plates, cars and drivers to see if I can detect any “probable cause”, Ha,Ha!! Can’t break old career habits! Incidentally, I believe freshman returned to the new high school when it school was completed. Ken, you have a Miss Sadler substitute here. “Class” can be singular or plural, just like the word “team”. If you mean the whole class as one body, then it is singular. If you mean each individual in the class, then it is plural. Miz Pam, Mam, with all due respect, I could NEVER see you as a Miss Sadler substitute. I’ll never forget once when I disputed an answer she had marked wrong on a test. The next day I came into class with proof that I was right. She conceded the point, but made it very clear to me that she did NOT like to have her judgment questioned. Lord help me if I had challenged her and NOT been right. Ken, you are a suberb pictorial and editoral historian. I recognize Kenny or Kenneth McElreath, Jim Reynolds, Louie Loos and Gary Schemel eating in the cafeteria. In the Tiger Den, I recognize Dee Ann Bockhorst. At the Freshman Dance, I recognize Amy or Beth Barringer and Mike Young. Yeah, I like the ring of that. It sounds much better than “pack rat,” which is what someone who lives in my house calls me. Ken, Thank you for such a speedy response. We don’t care who the people are in the photos – what class, age, etc. We are wanting to view the room as it was from various vantage points. One of my classmates does creative video work. He is wishing to have a photo that fairly well depicts that room with the idea of possibly projecting it in large size on a wall at the country club – so the fewer the people, the better. If you come across other photos, I would love to see them. I will pass these along to others on our committee. Thank you very much for this and all you do.